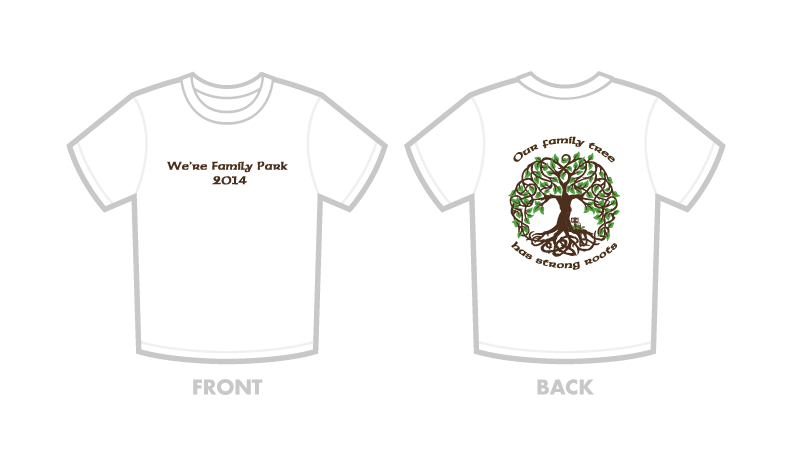 WFP T-Shirt Fundraiser – We're Family Park, Inc.
← Announcing artwork competition for WFP t-shirt fundraiser! The 2014 reunion at We’re Family Park has come and gone but don’t let that stop you from owning one of these awesome T-shirts. If you didn’t get a chance to buy one at the reunion or for some reason you didn’t get to attend this year, have no fear, we’ve got you covered. If you live close enough (as in Central WV) to pick it up, you can purchase one from Dale Dennison for $10. If you would like one shipped to you, we can do that to. Just let us know and we’ll work out the shipping costs with you. You can contact us on Facebook or you can contact Dale Dennison directly. Thanks to Jane Dennison (2-6-1) for coordinating the design and purchase of these shirts. Let’s get these shirts sold and out the door.